How Steve Jobs Helped This North Korean Defector 'Think Different' : Parallels When Kim Hak-min got to South Korea, he saw his first-ever smartphone, the iPhone 4. It changed his life trajectory. 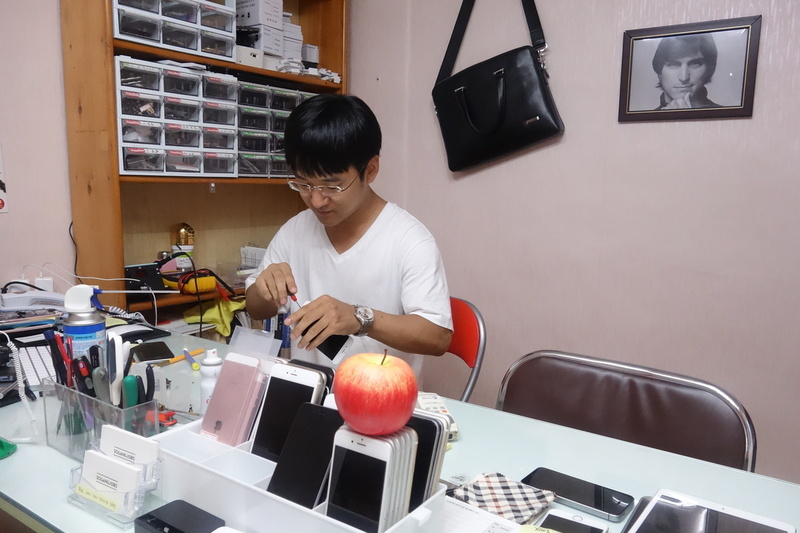 Kim Hak-min, 30, is an electrical engineering student at Sogang University who fixes iPhones as a side business. In his North Korean mining town, Kim Hak-min loved getting his hands on electronics so much that he became the go-to guy to fix his neighbors' watches, TV's and radios. It earned the nickname "Repair Boy." "I remember first opening up an electric toy when I was eight years old, figuring out how it worked and clutching it when I went to sleep," Kim recalls. But by 2011, Kim had yet to encounter a smartphone. "When I was in North Korea the only phones I saw where 2G and they were flip phones," Kim says. He did get glimpses of life in South Korea, through secretly watching South Korean soap operas, known as K-dramas. They are commonly snuck into the North but forbidden to view. "I remember hiding in my house watching them," Kim says. Kim was caught by state police and endured arrest, detention and torture for his crime, but exposure to the dramas had already made an impact on his thinking. "During the years of the famine I was starving, but watching these dramas made me feel like I was looking at heaven," Kim says. After a decade of planning, then 24-year-old Kim snuck across the North Korean border with China and brokers helped get him into Thailand and finally into South Korea, where smartphones are ubiquitous. Here, in the home country of Samsung, Kim fell in love with the Apple iPhone. It was 2011, and the first model he encountered was the fourth-generation iPhone, the iPhone 4. He looked at other phone options, but "it was the iPhone that really caught my eye," Kim says. "It was quite breathtaking." A friend then bought him Walter Issacson's biography of Apple founder Steve Jobs, and Kim says the Jobs story changed his life. "The book is what really helped me adjust to life in South Korea," Kim says. "It also helped me decide to go to college. It motivated me, inspired me, and brought me purpose in life." Today, Kim Hak-min has parlayed his childhood fascination with electronics into a side business fixing broken iPhones and iPads on the campus of his college, Sogang University. He calls the business "Sogang Jobs," after his hero. His clients say he comes highly recommended. "I've heard great things about him, and he's known to be an honest businessman," says Lee Myung-ja, a client who showed up at his home office last week after finding him through word-of-mouth. While he works — he says he's most commonly replacing cracked screens --behind Kim's desk is a framed photo of a young Steve Jobs, the same one on the cover of the Jobs biography. Kim says he's read it twice. He's now working on his electrical engineering degree with another eventual destination in mind: America. "I wanna go visit the Apple headquarters. It was a revolution that started from a garage. I wanna visit Steve Jobs' birth home, and I wanna visit all the sites that have to do with Steve Jobs' history," Kim says. Like many in Silicon Valley, he says he eventually wants to be a maker. "After I graduate I want to work with more ideas and invent things," Kim says. Steve Jobs himself said the first ever smartphone Kim encountered — that fourth generation iPhone — was impressive. "This is really hot. And there are well over 100 new features," Jobs said, in the phone's unveiling at 2010, one of his final keynotes before his death. One of the more unexpected features of that phone was inspiring this North Korean's new life. Jihye Lee contributed to this story.